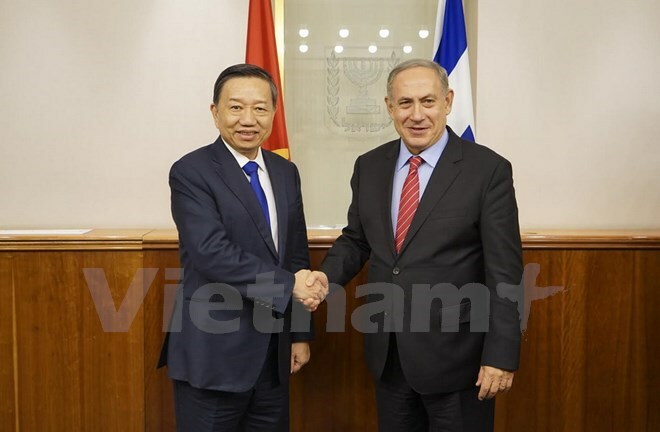 Public Security Minister General To Lam met with Israeli Prime Minister Benjamin Netanyahu in Tel Aviv on November 15, during which he thanked the PM for directing Israel’s agencies to cooperate with Vietnam’s Public Security Ministry in past years. Public Security Minister General To Lam meets with Israeli Prime Minister Benjamin Netanyahu in Tel Aviv on November 15. Lauding the achievements that Israel has made during the country’s development, General Lam affirmed that Vietnam hopes to strengthen cooperation with Israel. He also expressed delight that 23 years after establishing bilateral ties, cooperation between Vietnam and Israel has grown in politics, science-technology, economy, trade, investment, agriculture, telecommunications, education-training, security and defence. PM Netanyahu said he believes General Lam’s visit will help boost friendship between the two governments and peoples and the partnership between Israel’s National Security Council, Public Security Ministry, and Defence Ministry and Vietnam’s Public Security Ministry. The Israeli leader also expressed pleasure at the outcomes of talks between Israel agencies and the Public Security Ministry of Vietnam, saying that he supported the cooperation plans. He expects the two sides will soon develop an annual dialogue mechanism between the Israeli Public Security Ministry and National Security Council and the Public Security Ministry of Vietnam, while forming a legal corridor for the signing of agreements on labour, prisoner transfer and criminal extradition. The same day, General Lam held talks with acting head of the National Security Council of Israel Jacob Nagel, during which the two sides agreed to foster affiliation in all fields, especially in combating trans-national criminals. They shared the hope to strengthen the partnership among agencies of the two bodies through existing cooperation mechanisms, while increasing affiliation through Interpol and coordinating in tackling organised crime. Earlier, General Lam had a meeting with Gilad Erdan, Israeli Minister of Public Security, Strategic Affairs and Minister of Information. The two sides agreed to increase the sharing of information and experience in fighting trans-national criminals and international terrorists. They agreed to work together to ensure the security of representative offices of businesses and citizens of each country while living, studying and visiting each other’s country. The two sides will soon form a cooperation mechanism in protecting confidential information, expand coordination in cyber security and exchange information and experience in tackling cyber crime. At a meeting with Israeli Minister of Defence Avigdor Lieberman, both sides discussed boosting cooperation in enhancing the capacity of the security industry.